It had not been planned as a historic mission, yet it would have represented a moment of sorts: the first all-female spacewalk. The two astronauts who were scheduled to walk together in space Friday, Anne C. McClain and Christina H. Koch, would both need to wear a medium-size torso component. But only one is readily available at the International Space Station. The mission itself is unchanged. 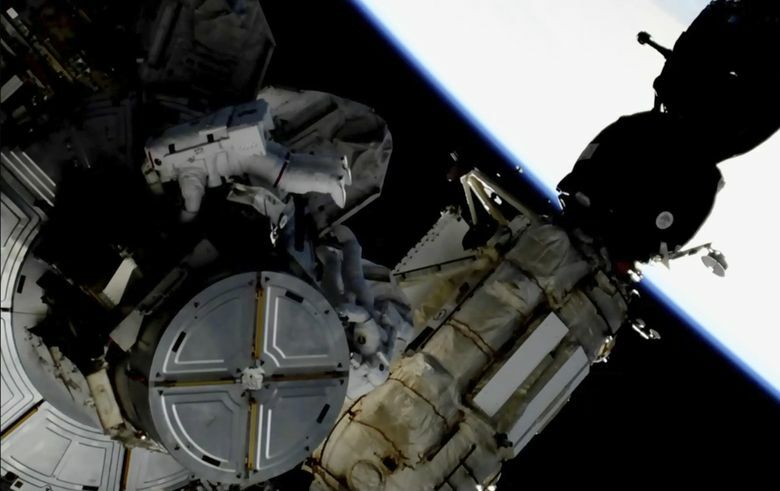 On Friday, two astronauts will venture outside the space station on a six-hour mission to install massive lithium-ion batteries that will help power the research laboratory. Koch is still scheduled to participate, along with fellow astronaut Nick Hague; McClain did her first spacewalk last week. But the first women-only venture outside of the confines of the space station will have to happen on another day. “After consulting with McClain and Hague following the first spacewalk, mission managers decided to adjust the assignments, due in part to spacesuit availability on the station,” NASA said in a statement. Stephanie Schierholz, a spokeswoman for NASA, said in an interview Monday that there were already two medium-size hard upper torsos — “essentially the shirt of the spacesuit,” according to NASA — at the space station. But there were a couple of issues. One was that McClain had thought she would be able to work in a large-size torso, but after her spacewalk last Friday, she wore a medium-size torso and learned that it fit her better. Koch also uses the same size. And of the two medium-size torsos available, one has yet to be properly configured for a spacewalk. It would take hours of crew labor — not to mention some additional risk — to fix that in time for Friday. Instead of doing that, NASA decided to simply switch out the astronauts. In the end, both women will have done a spacewalk — just not together. “When you have the option of just switching the people, the mission becomes more important than a cool milestone,” Schierholz said. On Friday, Koch and Hague will be supported by a team on the ground that includes a number of women in key positions, including the spacewalk’s flight director, Mary Lawrence, and its lead officer, Jackie Kagey. In a briefing at NASA’s Johnson Space Center in Houston this month, Lawrence, Kagey and Kenneth Todd, the station’s operations integration manager, said officials had not immediately recognized the significance of the original lineup for Friday’s “extravehicular activity,” or EVA. It was only as they discussed the schedule during a meeting that they realized it was the first time they had scheduled an all-female spacewalk. After the rescheduling Monday, Schierholz said that while there were no concrete plans for an all-female spacewalk, one is increasingly likely because NASA astronauts have been diversifying in terms of gender. “We’re sort of getting to the point of inevitability,” Schierholz said of an all-female EVA. McClain and Koch were part of the 2013 astronaut class, and of the eight people in that class — chosen from more than 6,000 applicants — half were women, a first for NASA. The agency lists 38 active astronauts on its website, and 12 are women. The current roster of six astronauts at the space station — three Americans, one Canadian and two Russians — allows the team to carry out a number of important projects, with an eye toward making sure each crew member accumulates significant experience, Todd said. NASA officials hope the relatively young American astronauts will continue to travel to space in the coming years and assist new recruits in the future. The batteries being installed on this mission store solar power that the station needs when it is not in direct sunlight. Work on the battery systems will continue for the next few years as international teams bring more lithium-ion batteries to the station, which is more than 200 miles from Earth. The missions require meticulous planning, and robots do as much of the work as possible before astronauts take the risk of venturing into space. In the busy days before a spacewalk, the crew help to prepare and fit their colleagues’ spacesuits, which function as mini-spacecraft once they step outside. Koch shared photos on Twitter of her colleagues as they suited up for last Friday’s spacewalk. “No ordinary battery swap & work day routine,” she wrote.